The eight stories in this collection explore romantic relationships against the background of Hong Kong’s crowded streets. A hillside walk, a tram ride, a court case, a demonstration – or warming noodles in the office pantry – bring the characters together and provide the setting for their encounters. The unique spirit of the city pervades the stories and plays a part in their resolution. Oppressed by an old love affair, Sharon finds new inspiration one bright morning during a walk on Bowen Road. Fi Fi Yeung is in control of her job at the Kiangsu Bank, of her family and of herself. Then into this organized world steps the forceful Mr Moore. As Fi Fi gets to know her new colleague, she begins to think of a different future. But change is sweeping through the bank’s headquarters in Queen’s Road Central, and Fi Fi is in control no longer. Sandra has come to terms with her life but then on a tram ride to Admiralty she glimpses her former lover. In Queen’s Road East, Dudley believes in the purity of his admiration for a young waitress, but must struggle with a friend’s skepticism, a depressed property market, and family burdens. Baffled by a bizarre sexual assault case in Justice Drive, Polly must learn from her male fellow jurors. Demonstrations, high finance, and local politics swirl around Chater Garden, prompting a young bond trader to question the meaning of her life. Others offer their guidance – and romantic attention – but Pony is inspired by a Mainland activist who does not even know of her existence. In her office overlooking Pedder Street, Georgina finds her new management accountant a disturbing presence. Struggling to raise her son in Hennessy Road, Ling Ling faces a dilemma, and finds help from an unlikely source. And he leant forward earnestly. Georgina cleared her throat. “We’ve some new blood in the department,” she began, rumpling her napkin. Andrew was solicitous now. “Yes,” Georgina went on, “a young chap has just joined us – actually he’s from your firm. He seems very good, gets his work done and has made a contribution already. Of course, it makes an impact on the department. We’re all girls, you know!” She laughed, and took a sip of water, but swallowed it the wrong way. Spluttering, she put the glass down heavily, and spilt it. A fatherly waiter hurried over and patted the wet patch with a napkin. “Well, I guess I have to be careful.” Georgina pursed her lips. “It would be dreadful if he got the wrong impression.” She picked at her sole, and then as if making up her mind, cut a large piece and put it in her mouth, relishing the sweet juice as she chewed. “Oh, I’m sure he fancies you like mad,” said Andrew. “Rubbish!” exclaimed Georgina delightedly, slapping him on the arm. The two friends finished their meal in good spirits. Andrew called the waiter over, and signed the chit. “Well, I must let you get back to your young man,” he said, “he’ll be pining for you.” They got up to go. As they walked out, a hearty English voice hailed Andrew from a nearby table, and he stopped for a confidential word. Georgina continued towards the doorway and, with a wink at his friend, Andrew hastened to rejoin her. Click on the play control below the picture to hear the author, Matthew Harrison, reading a short extract (5 minutes). 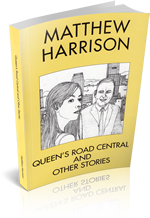 If you have enjoyed the above extracts, you can download a full short story from Queen’s Road Central. Simply click to read online in another window, or right-click and ‘Save Target As…’ to save on your computer. More extracts can be found on our Hong Kong Short Stories page.